Mawine G. Diggs has gone back to her native Liberia numerous times since first coming to the United States around the age of 7, and now she’s planning the ultimate return home as the African nation’s newly appointed director general of the National Commission on Higher Education. 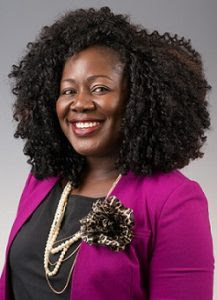 Diggs, president and chief academic officer of the Eastern Campus in Michigan’s Wayne County Community College District, starts her new post next week as an appointee of Liberian President George Weah. As the first woman to head the NCHE, which was established in 1989, she will oversee policy and regulation regarding all institutions of higher learning in the republic, foster national alignment and build international collaborations. Liberia has a large college-age population, Diggs noted, and part of her challenge will be to lead the way in connecting citizens to post-secondary educational resources that lead to economic uplift. The youngest of four children, Diggs came to the United States with her mother, who pursued higher education here. Liberia’s infrastructure, including schools, were extensively damaged during the country’s first civil war from 1989 to 1997. Her father died during the war. Diggs returned to Liberia for junior high and high school, worked a couple of years after graduating and then came back to the U.S. for college. She attended Roanoke College, becoming a charter member of the school’s chapter of Delta Sigma Theta sorority and the first Black student government association president before graduating in 2006 with a bachelor’s degree in sociology and environmental policy. Diggs has a master’s degree in education from Clemson University and is a doctoral candidate in the field of higher education at National American University. An advocate of diversity, she has taught leadership courses at Clemson and at the University of Maryland – College Park, where she also worked in residence life. She assumes her new position in Liberia at a time when other changes in higher education are afoot. In June, the acting director of the NCHE , David S. Dahn, moved to shut down six institutions of higher education that were said to be operating illegally because they lacked an operational permit and provisional accreditation. Those schools were Dayspring Bible College, Grace International Bible University, Pilgrims College & School of Ministry, Liberi College of Nursing & Divinity, New Dimension Theological Seminary and the ASSFI University College. As a second home, the U.S. has given Diggs not just higher education, but a support network and valuable experiences that built on her family traditions and cherished values, she said. “Every experience has helped shape me and prepare me for this moment,” she said. “Everything I’ve done has prepared me to return home and work in the education sector there.